Celebrate the New Year in paradise with Valentines Residences Resort and Marina on Harbour Island in The Bahamas. 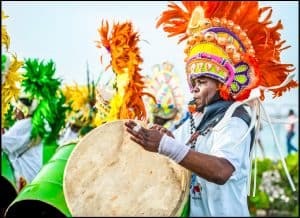 To usher in 2018, the award-winning resort will be partnering with The Bahamas’ premier entertainment company, Reckless Pirates, to host a “Cultural Invasion” featuring a variety of events throughout the holiday weekend. The celebration will kick-off Friday, December 29th with a fashion show by Calico Trading Co. from 5 pm-7 pm. A “Reckless Pirates’ Happy Hour and Glow Party” will take place immediately after at 7 pm and will feature live entertainment, games, drink specials and more. The festivities will continue Saturday, December 30th from 5 pm – 8 pm with a “Reckless Pirates Cultural Show” throughout the property, which will include a Junkanoo Rush Out, Reckless Pirates costume launch, live entertainment as well as fire and limbo dancing. On Sunday, December 31st, guests of all ages are invited to participate in a Family Treasure Hunt Party for cash prizes and giveaways. Entrance Fee will be $5 for adults and $3 for children. On New Year’s Eve night, Valentines will host a “New Year’s Eve Gala Dinner” onsite at The Boathouse restaurant. Beginning at 6 pm, the dinner will offer a Prix Fixe menu featuring a delectable five-course meal and bottle of champagne for two. After dinner, guests will be treated to entertainment provided by The Bahamas’ very own Patrice Murrell from Nassau and fireworks at midnight. Dinner is $250 per person, plus 15% gratuity and 12% VAT. Capping off the celebration on New Year’s Day will be a “Pirates’ Junkanoo Rush” Event, featuring a Pirates Fun Rush Junkanoo from 4-6 pm, and a Pre-Pirates New Year’s Rush Party at 6 pm with a portion of all proceeds to benefit the local and Government clean-up program and HIAS. The events are open to the public on a first come, first serve basis. To make a reservation for the New Year’s Eve Gala Dinner, please call 242-333-2142. Named best Small Hotel in the Caribbean by Caribbean Journal, Valentines award winning resort is the finest Residence Resort on Harbour Island and well-known for its warm ambiance, spacious accommodations averaging 1000 SF many with full kitchens, a 51-slip full-service sport fishing and yacht marina, and the Island’s famous pink sand beach. To learn more visit http://www.valentinesresort.com or friend them on Facebook. For reservations call (866) 389-6864 or email reservations@valentinesresort.com. Valentine Admin	December 15, 2017 0 Com. Valentines Residences, Resort & Marina is the most vibrant and exciting luxury resort in Harbour Island, Bahamas – the vacation destination ranked "Best Island in the Caribbean" by Travel and Leisure Magazine. Known and beloved by the travel elite for our famous pink sand beach, turquoise water and renowned Harbour Island hospitality. Valentines Residences, Resort & Marina is not owned, developed or sold by Preferred Hotel Group, Inc., Interval International, Inc., or any of their respective affiliates. Valentines Residences, Resort & Marina uses the Preferred Residences® trademarks and names under a license from Interval International, Inc., which may be terminated or revoked according to its terms. Preferred Residences® and its related marks and logos are all property of Preferred Hotel Group, Inc. All rights reserved.